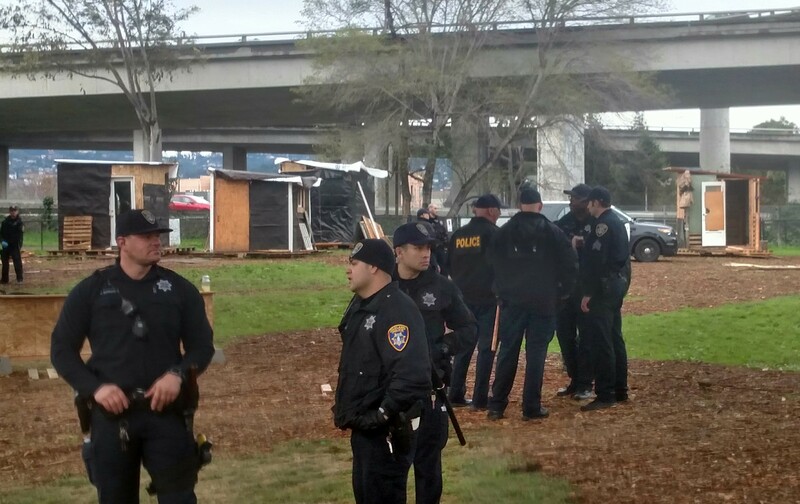 Law-enforcement officers at "The Village" homeless encampment this morning. 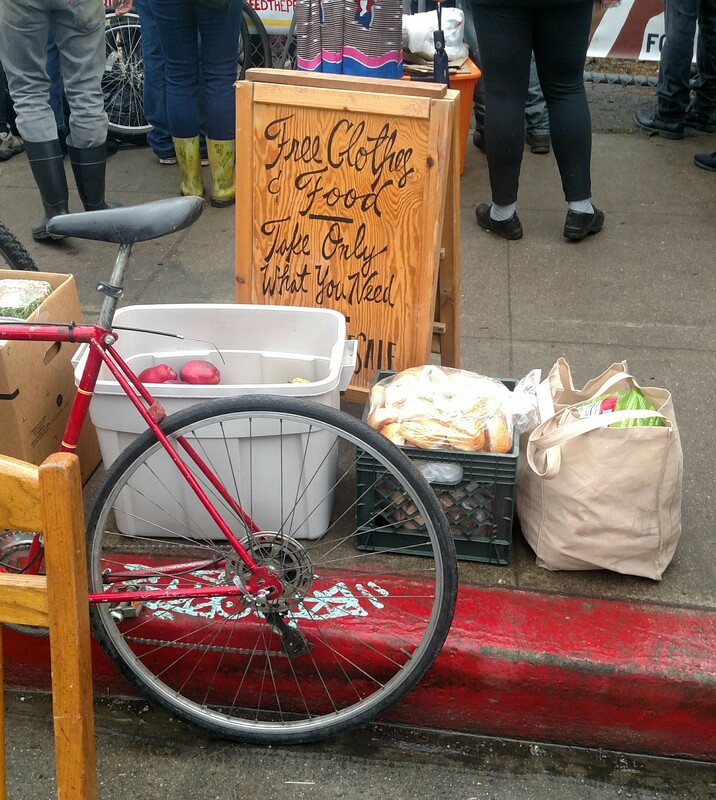 The city cleared out the community, which first appeared in North Oakland in late January. Dozens of Oakland police officers and public-works employees ousted an elaborate, unpermitted settlement of small structures, tents, and hygienic facilities in North Oakland’s Grove Shafter Park this morning while scores of supporters looked on in sadness and anger. Most residents of "The Village," a small encampment that appeared weeks ago, were allowed to collect goods and furniture before city workers began destroying the small, insulated buildings. Activists say they erected them to meet the immediate needs of Oakland’s homeless community. 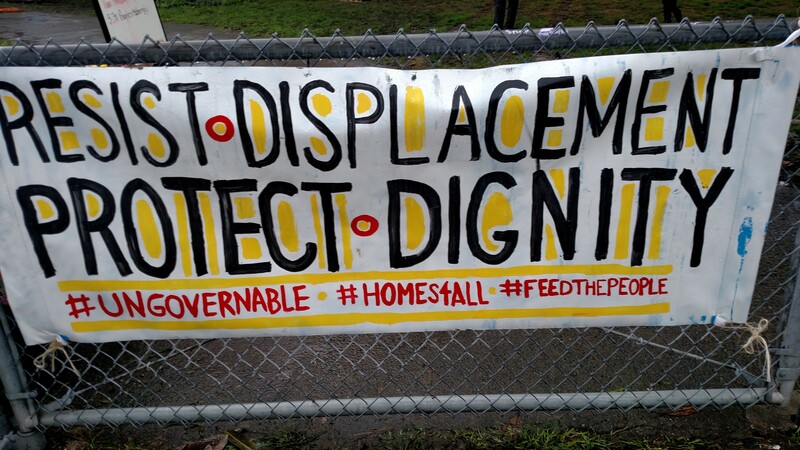 Organizers say the encampment, also known as "Promised Land," sheltered sixteen people. But the community also provided resources for those in need, including free clothing and food, since it was established on January 21. The Village featured four main structures, plus a shower, a portable latrine, wooden platforms to put tents on top, 24-hour volunteer security, and policies prohibiting drug use and alcohol. Volunteers laid mulch over patches of muddy grass in the park, and even painted murals on the columns supporting the roaring freeway above. They also revived the swatch of grass’ old name: Marcus Garvey Park. Donated goods on the curb near The Village this morning. To some residents, the Village was a glimpse of relative stability. “We had hot meals, bathrooms, love, respect — that’s why we called it the Promised Land,” said Rory Keller, who arrived after being evicted from a West Oakland warehouse in December. Angela McCleary, who moved to the camp from a nearby freeway underpass, said city employees prevented her from collecting her belongings. “All I have is left is on my back,” she told the Express. Majid Ahmed was attracted by the Village’s policies prohibiting drug use. He also said that the resources and security helped him reach ten days of sobriety, his longest stretch since he began using at the age of 12. “So, this breaks my heart,” he said. As recently as Monday, dogs ran off-leash at the park, and neighbors skated on the basketball court, much like they did before the encampment appeared. An organizer who asked to be identified as Drea said that “housed and unhoused folks” coordinated the community, including activists associated with Asians for Black Lives. Earlier this week, the Village received a 72-hour notice-to-vacate, which prompted residents and supporters to call for amnesty during public comment at City Council on Tuesday. “With a budget of zero dollars, we’ve managed to provide dignity and basic needs to sixteen homeless people,” organizer Needa Bee told council members. Many other speakers, mindful that the city is preparing for a new budget cycle, argued that it’d cost more to clear the encampment than it would to tolerate it. Officials countered that The Village posed public-safety hazards, such as open flames, and that it garnered complaints about restricting park access. Joe DeVries, an assistant to the city administrator, told the Express this morning that the Village violated at least eighteen laws. It was also a liability, he explained, because it constituted a breach of the city’s lease with Caltrans, which owns the land. Look for more on this story in the February 8 issue of the Express. A protest sign near The Village this morning.